Limitations of BMI — Fitness Lab Testing. Assessments. The Body Mass Index (BMI) was created in the mid-19th century by Adolphe Quetelet, and it has prevailed since then. It is commonly used as a screening tool for overweight and obesity. However, BMI has several limitations and can sometimes lead to screening errors. The BMI is defined as the body mass divided by the square of the body height, and is universally expressed in units of kg/m2, resulting from mass in kilograms and height in meters. Here’s a simple tool for calculating BMI. The BMI is often used to classify individuals in one of the following categories: underweight, normal weight, overweight, or obese. 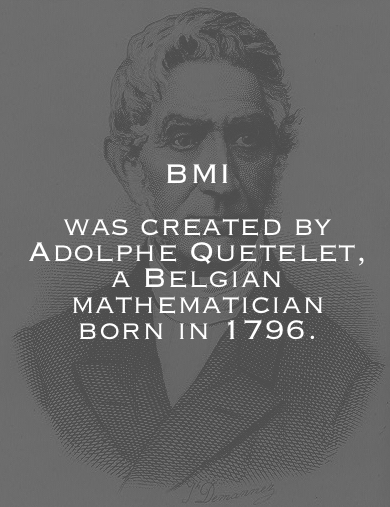 The basis of the BMI was devised by Adolphe Quetelet, a Belgian astronomer, mathematician, statistician and sociologist, from 1830 to 1850 during which time he developed what he called "social physics." The modern term "body mass index" (BMI) for the ratio of human body weight to squared height was coined in a paper published in the July 1972 edition of the Journal of Chronic Diseases by Ancel Keys. In this paper, Keys argued that what he termed the BMI was "...if not fully satisfactory, at least as good as any other relative weight index as an indicator of relative obesity." 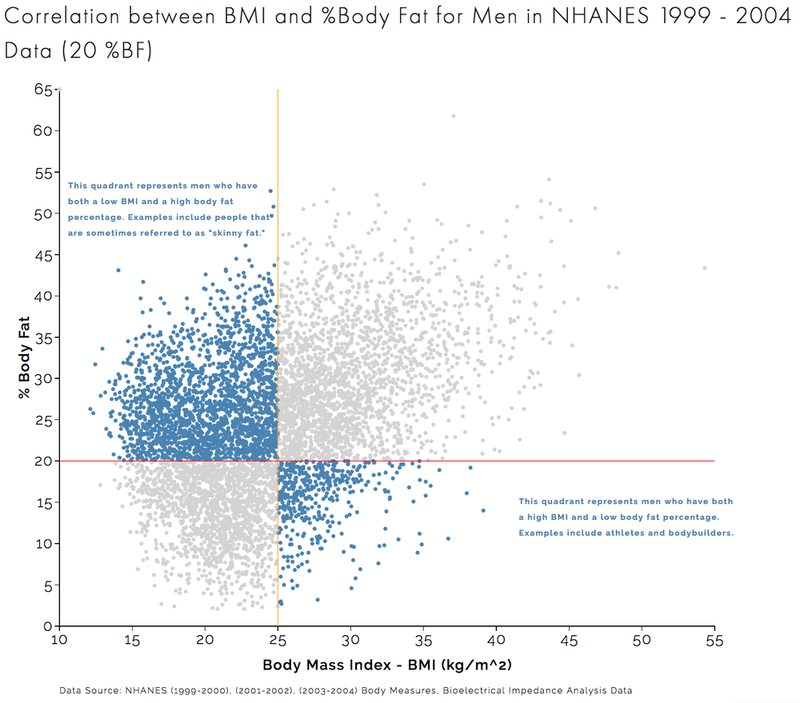 The graphs show the correlation between body mass index (BMI) and percent body fat (%BF) for both women and men in NCHS' NHANES survey data. Data in the upper left and lower right quadrants suggest the limitations of BMI. 2. BMI DOES NOT INDICATE WEIGHT DISTRIBUTION. Individuals with a similar BMI could have drastically different body shapes, and thus varying risk of disease and early mortality. The individuals below have the same BMI, but they have different health risk profiles. 3D body shapes of individuals with the same weight and height (and BMI). The individual on the left has the highest health risks. Source of the 3D models: Body Labs. The above image shows the 3D body models of four women with the same weight (130 lbs) and height (5"4). While the four women have the same BMI, they have completely different health risks. It is now well established that individuals with higher levels of visceral fat (i.e. body fat that is concentrated around the midsection area) are at much greater risk of disease and early mortality. As a result, the woman on the left side of the above image has higher health risks, since her body shape shows a higher concentration of fat around the waist area. Waist-to-Hip Ratio (i.e waist circumference divided by the hip circumference). Body Volume Index / 3D body shape. Curious about the alternatives to BMI? Here's how you can measure body fat using DEXA for body composition and the BOD POD body composition test. Accuracy of Body Mass Index to Diagnose Obesity In the US Adult Population. The Health Risk of Obesity—Better Metrics Imperative.